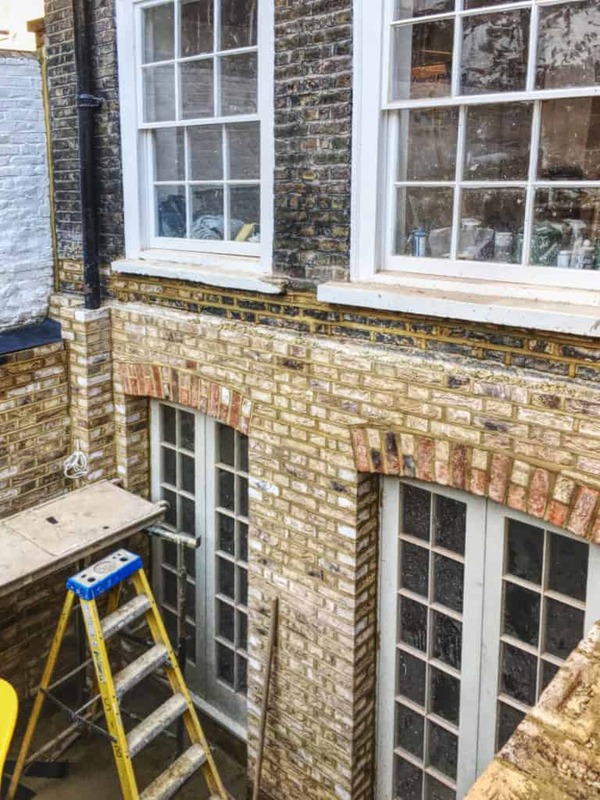 We’re nearing completion on our renovation of a Grade II listed house in Chelsea. While we apply the finishing touches, here are some photos looking back on the project’s journey. Here’s the garden of the house shortly after initial excavation began to build the lightwell and lower courtyard connecting the lower ground floor to the garden. The structure at the back is a small garden studio, while the scaffolding on the right is from a neighbouring development. Now we’re looking down into what will become the lightwell and lower courtyard. The concrete wall is in the middle of the photo is holding back the tons of soil from the garden, which was gradually extended downwards by repeatedly pouring concrete then excavating beneath after it set. The wall on the right of the photo was removed. Once the excavation was complete, we built a new wall with matching materials and flanked the courtyard in brick. A stairwell up from the lower courtyard to the garden fills the void on the left of the photo, above which will be large planting. This freshly-built will is still drying, and when it has, it will be sprayed with a soot to match the original brickwork above. We used period style timber French doors to match the sash windows in the rest of the house. Most of the project involved delicate interior renovation to preserve or restore original period features. It was in the bathrooms where we could be most creative with the interior design, as seen in the striking almost-finished bathrooms above. This project will be completing this summer, and we look forward to sharing more information when our clients get the keys to their dream home.